Tableau is a business intelligence tool for interacting with and visualizing data via SQL. 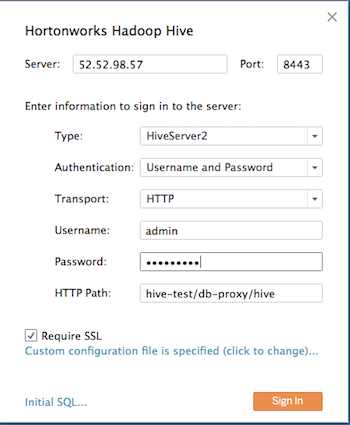 Connecting Tableau to Hive requires the use of an ODBC driver. In this example, we provide high-level steps required to set up Tableau to access Hive. Download the Hortonworks ODBC Driver for Apache Hive from https://hortonworks.com/downloads/#addons. Next, extract and install the driver. Launch Tableau. If you do not already have Tableau, you can download a trial version from https://www.tableau.com/trial/download-tableau. Server Enter the public hostname of your controller node instance. Check the Require SSL checkbox. Click on the text underneath the checkbox to add a configuration file link. 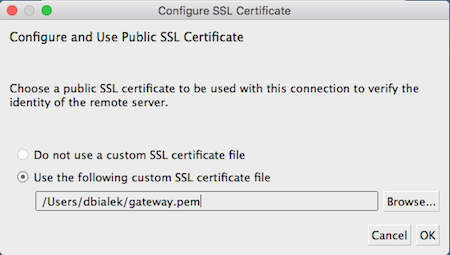 Specify to use a custom SSL certificate, and then browse to the SSL certificate gateway.pem file that was generated when you downloaded the SSL certificate as a prerequisite. Click Sign In and you will be connected to Hive.